New form. 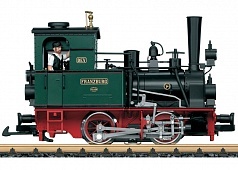 The V 36 is an extremely versatile locomotive that an equally good figure before short passenger and freight trains as a suitable partner in the series 64, with her ​​on many branch lines of the DB handled the entire train and shunting together. The model is driven by all three axes. There are many, baureihe typical blinds and fan grill of the model resists precise, has detached handle bars, the required change of direction with the change of light, is prepared for digital operation and can be retrofitted with a sound module.